What’s New in Version 7.17.X? In a basic, single-segment network, Synthetic SE Servers share the same network as the TT Gateways and trading clients. All of the TT Gateways send non-coalesced prices to the multicast. This deployment works well when your network bandwidth can comfortably handle the volume of price data needed to by the trading clients from the TT Gateways. For example, you might use this deployment if most traders trade the same few contracts every day and only a few need to access the network through a WAN router. The following figure illustrates a network where each TT Gateway configures its Price Server to send non-coalesced prices. In this environment, the TT Gateways support Price, Order, and Fill Servers, with the Price Server configured to disseminate non-coalesced prices to the multicast. 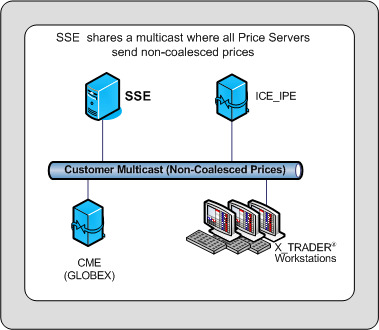 Synthetic SE can share the same multicast prices from the TT ICE and CME Gateways with local X_TRADER and remote trading clients. Using Notepad, open tt_sse.ini, located in <root drive>:ttconfig. Add login information to the [gw-Exchange-Flavor] section, where Exchange-Flavor is the gateway to which you want to connect. Determine whether this Synthetic SE will be the primary for this TT Gateway if a client logs into multiple Synthetic SE Servers, and add the Primary configuration option with the appropriate value. Add additional [gw-Exchange-Flavor] sections as needed.